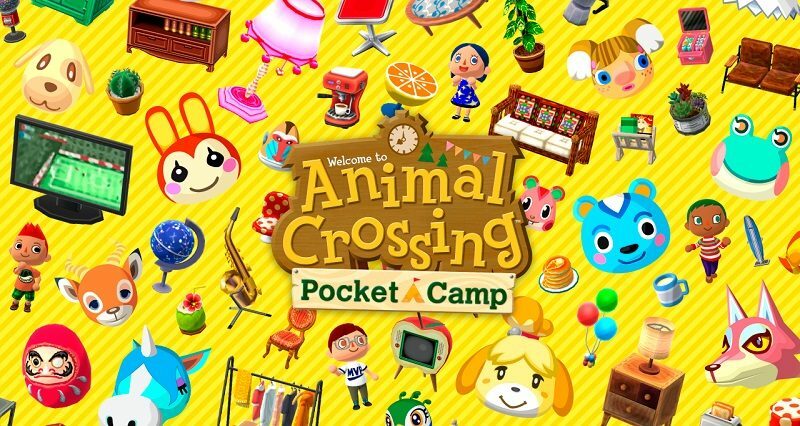 On October 25th 2017 (in Australia) and late November (worldwide), Nintendo released Animal Crossing: Pocket Camp on Android and iOS. Unfortunately, it did come with some issues, which is why we created this page: to list as many of them as possible, and offer workarounds and possible solutions (or simply more details, when there’s nothing that can be done). We intend to keep this page updated as long as possible. If you see an issue missing, or if you’ve found a solution on your own, make sure to let us know in the comments below. Also, do note that this isn’t an official support page, just a handy page for fellow Animal Crossing: Pocket Camp players. 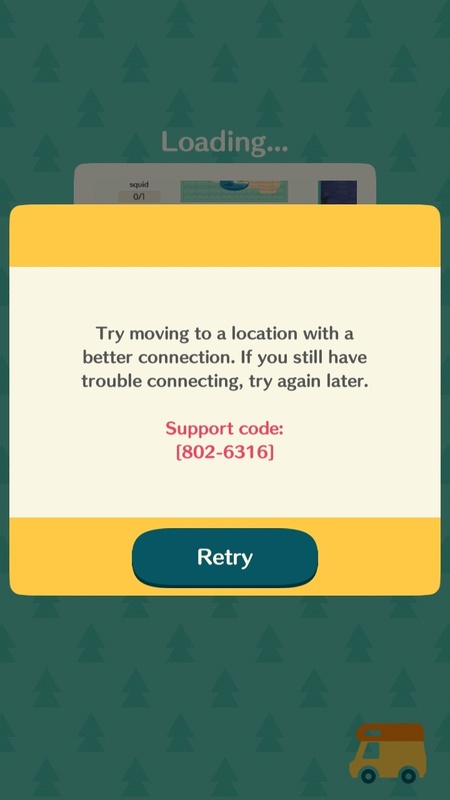 In some cases, you may need to contact Nintendo support: you can find a link within the app, or on the official Nintendo website of your region. But before you do, make sure to check out the official FAQ, where you will find plenty of details about the game. You might find the answer to your question, or the solution to your problem, there! Also, before you try finding a solution to any issue you may be encountering, make sure you have the latest version installed: click here for more details! Cause: wrong region for the Nintendo Account. Right now, the game is only available in Australia, so only Nintendo Accounts sets to Australia can be linked at the moment. Fix or workaround: the app is now available worldwide, and as Ver. 1.0.0, you can link a Nintendo Account of any region with the game. Fix or workaround: make sure you’re connected to the internet, and that the quality of said connection is good (Wifi is better, if available). 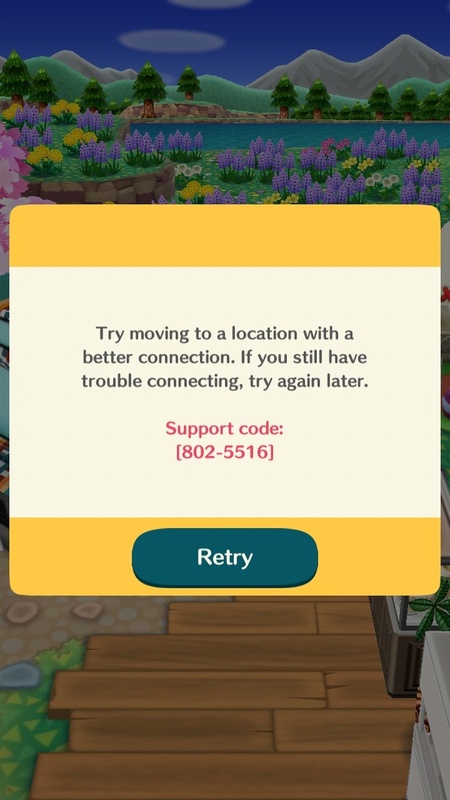 If you’re getting that error despite being connected to the internet, the quality of the connection may not be good enough. 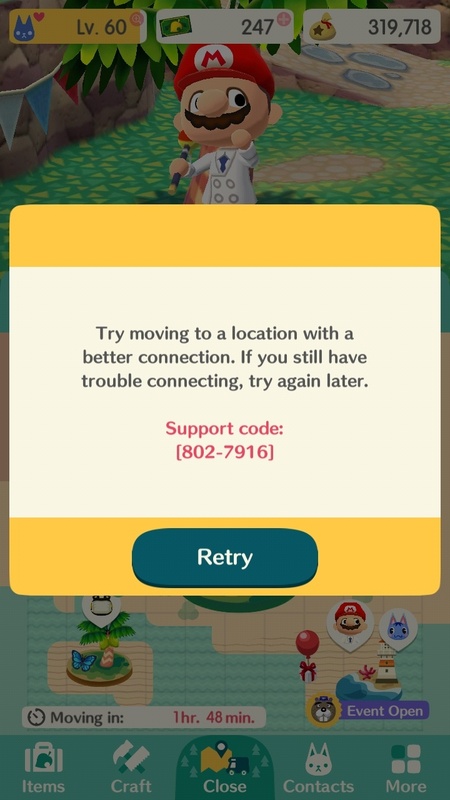 Fix or workaround: Nintendo is aware of the problem, and working towards fixing it. Nothing much for you to do but to wait and try again later. If you’re still getting this error several days after launch, you may need to contact support. Fix or workaround: none at the moment. Try clearing the cache of the game and try again. You can also try to restore your save data (Title Screen > Main Menu (icon in the top-left corner) > Data Restore). Nintendo may also fix the issue in an upcoming patch, but nothing has been announced so far. Fix or workaround: none at the moment. Nintendo is aware of the issue, and currently working on a patch to fix it. Make sure to keep an eye out on the Animal Crossing: Pocket Camp Updates page to find out when the update is released! Update to Ver. 1.1.1! Fix or workaround: fixed in the latest update! Fix or workaround: fixed in the latest Software update (Ver. 1.2.2)! Fix or workaround: speak to Leif again, and select “I think I can manage.” Issue fixed in the latest Software update. Fix or workaround: issue has already been fixed. You first need to restart the game. Fix or workaround: issue fixed in the latest Software update. Fix or workaround: issues fixed in the latest Software update. Make sure to restart the game! Fix or workaround: issue fixed in the latest Software update. Make sure to restart the game! Fix or workaround: issue fixed in the latest Software update. You can prevent this issue from occuring by changing location before closing the game. Do note that the issue may also occur if you do drop the fruit or collect it. Fix or workaround: issue already fixed. Fix or workaround: issue fixed in the latest Software update. You can speak to Digby at the campsite in order to clear the icons. Fix or workaround: already fixed. All players will get Leaf Ticket x15 as apology gift! Check out this page for more details! Fix or workaround: fixed in the latest Software update. Fix or workaround: issue to be fixed in the latest Software update. Additional details: This issue does not occur if you do not tap on the screen until the “Here’s your reward!” screen appears. Also, even when the game force closes, the action is counted so when you return to the game you will receive the “Here’s your reward!” item. Fix or workaround: put away one piece of furniture or clothing. This issue will be fixed in the latest Software update. Fix or workaround: leaving the campsite and then entering it again should result in the lost item correctly registering as being found. This issue will be fixed in the latest Software update. Fix or workaround: will be fixed for the next Garden Event. Additional details: despite optimisations made in Ver. 2.2.0, the issue still persists. Fix or workaround: developers are currently working on different optomisations, which may take some time. Will most likely be fixed in the latest Software update. Additional details: issue occurs during the second half of the latest Garden Event, Viva Festivale with Pavé. Fix or workaround: Fixed via the latest Data Update, released on March 13th. Additional details: issue occurs when you’re at the point where leveling up will not unlock any new animals. Fix or workaround: developers currently working on a fix. More issues to be added later! and downloaded the .apk of the game. I meet K.K. for little moments, then the game go to crash. I try newly to start. Oh, you’re using an emulator? I’m afraid Nintendo is also blocking those (anything not stock-rom, not-rooted is blocked). A shame for people who can’t afford the latest smartphone yet play without cheating or hacking. My friend is having trouble with her account. Every time someone clicks on her camp, she shows up as a plain character named “Leaf” and has nothing on her camp grounds. The game works fine for her, but no one can see her camp. It was fine the first day, and now it does this every time. I’ve even unfriended her and added her again. What should she do? My sister has this exact same problem! First time I’m hearing of this bug. Have you tried clearing the cache of the game? I’ve got the support code 802-7609, not seen anything about this one and I can’t seem to sort it out myself, can anyone shed any light please? Haven’t seen this one anywhere (yet). Given the state of the servers right now, might be a good idea to wait until it’s calmed down to see if the error is still there. Update: just encountered it myself. I just tried again a couple of times, and it worked. Did it end up working for you? Can confirm it’s a communication error, due to servers issues. Nothing much to do but wait until it gets better, unfortunately. I had invited Apollo to my camp, and he has been around ever since…except the last time I played, in which he has just suddenly vanished into thin air. I can’t “call” him in the Contacts section, and I can’t find him at my Campsite. Can animals come and leave once I’ve added them? It’s just weird, as I try to talk to my animals frequently and I don’t understand why Apollo would just disappear unless there was some explanation. Yesterday and today I’ve been getting the error code 802-7667 every time I try to start the game. I have checked to make sure the app is updated, do you know what this error means? Sorry for the late reply. Are you on iOS? If yes, try downloading the latest update (Ver. 1.0.2), to see if it fixes the issue. Never heard of that particular issue, have you tried clearing the cache of the game? Alternatively, you can try to restore your save data if you manage to reach the title screen. Been getting Support Code 802-7668 all day. I try to play the game, but he shutting down after load start screen. My samsung galaxy s2 tablet is not rooted, but after a couple days I kept getting the error 802-5808. After a whole week of looking for solutions and waiting for it to clear up, I uninstalled and reinstalled the game. It worked fine for a few days, but now I’m getting the error again. If I try to use data restore I get error 802-5108. I tried contacting customer support, but there’s no real way to have a conversation with them. I have no idea what to do anymore. :( please help. I’ve been getting error code 802-7667 “unable to obtain data” all day. do you know what that code is for? The game is currently undergoing maintenance, so that error code is most likely for that. It will be over in a couple of hours (see this post for an estimated time: https://www.perfectly-nintendo.com/nintendo-maintenance-page/), so you should be able to download all you need then. I keep getting a bunch of different error codes while playing the game, they only show up when the game is loading a different area, or right after completing a request, when the loading icon is on-screen. 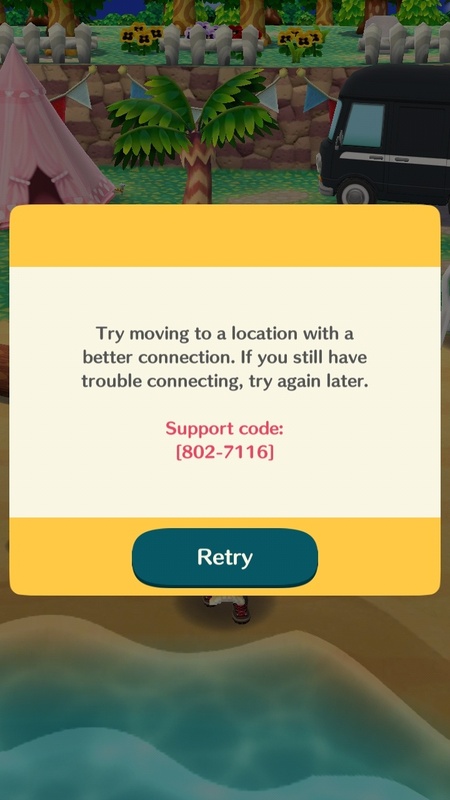 I have gotten error codes 802-7516, 802-7116, 802-7916, 802-6316, 802-6116, 802-5816, and 802-5516 from what I recall.. which all say to move where the connection is better, but I’ve always played from the same place at home and this issue has never happened before. I first noticed this issue yesterday (3/16/18) late afternoon. I thought the problem would’ve been fixed by now, but it’s still giving me error codes. This is completely bizarre, all my other apps and games load up, connect, and work great still.. it’s only ACPC that is acting up. Has anybody else had this problem? Can you give any advice? I have the same issue, but when I’m using mobile, no matter where I am and despite having a good connection and any other application or content works fine and fast.